Kinship Circle: Update – A Chance for Stu! Thanks to all who contacted LAAS to demand clemency for Stu! Thus far, it seems to have worked; Stu’s upcoming date of execution was stayed, and though he’s not out of the woods yet, it looks like the red tape’s being cleared for his eventual release. The next LAAS meeting is scheduled for 7/27, so keep an eye out for further updates. Subject: Update – A Chance for Stu! 7/13/09- UPDATE: A Chance For Stu! FULL STORY: Board of Animal Services moves to amend L.A. Code to free Stu! We’ve followed Stu’s saga since 2005. 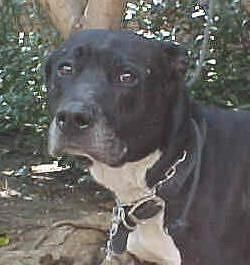 Today, the fate of this wrongfully impounded, non-dangerous dog hinged upon the Los Angeles Board of Animal Services Commissioners (7/13/09) meeting. If Stu hadn’t made it on today’s agenda, his euthanasia date would have remained 7/23/09 — as circulated in our last alert: 7/5/09: Stu Dies July 23. Stop Them. Single-custody dog cases are not ordinarily the type issues covered in KC alerts. Stu is different. His case is so glaringly unjust. On 6/18/09 we asked you to flood Los Angeles offices with pleas for Stu’s Life. You did. On 7/5/09 we urged you flood ’em again in order to repeal Stu’s 7/23/09 execution date — despite testimony from acclaimed animal experts that Stu poses no threat to humans. You did. Bottom line: As of today, there is no euthanasia date for Stu. Politics run thick so we can’t claim victory yet. But, things look good for Stu! Since Kinship Circle last wrote about Stu – the dog unjustly imprisoned and sentenced to death by L.A. Animal Services nearly four years ago – there’s been a development in the case. Despite a case filled with discrepancies, missing reports, and irregular behavior on the part of L.A. Animal Services and City personnel, the California Court of Appeals today ruled that the City’s sentence of death against Stu, a ten year-old dog with a record of one biting incident four years ago, when Stu had himself just been injured, could stand. This clears the way for L.A. Animal Services to euthanize a dog who many, including Animal Services Commissioners, feel was denied his legal due process, and who most agree presents no danger to the public. This despite assurances from Deputy City Attorney Dov Lesel at this Monday’s meeting of the Board of Animal Services Commissioners that it was unnecessary for the Board to take any action to save Stu, as a ruling by the Appeals Court could be weeks in coming. In light of this ruling, Stu’s execution has been scheduled for July 23, 2009. Even if you took action previously, please take a moment to look through this newest alert from Kinship Circle and follow through on one or more of the actions listed below. Though there’s much red tape to cut through, Stu can still be granted a pardon. Let’s help make that happen. Stu’s already served four years of an indeterminate sentence; now he deserves to go home and live out his senior years in peace, with his family. The LA Board of Animal Services must hold a special meeting by July 13, so please act now. 7/5/09: UPDATE – Stu Dies July 23. Stop Them. Act Before 7/13/09. Kinship Circle’s 6/18 Stu alert asked you to flood Los Angeles offices with pleas for the dog’s life. Now, a 6/23/09 court decision leaves Stu with a July 23 execution date — despite testimony from acclaimed animal experts that Stu poses no threat to humans. 1. LOS ANGELES BOARD OF ANIMAL SERVICES must hold a special meeting BEFORE July 13, 2009 (which is their next regular meeting). The Board president or three Commissioners are empowered to schedule this special meeting — but NO ONE HAS CALLED FOR IT. It’s purpose would be to discuss a Board recommendation, in writing, to spare Stu and send him home. The Board’s letter would then go to the Los Angeles City Council and Mayor. 2. By the Board’s 7/13 meeting, Commissioners must vote to send the Stu recommendation to L.A. CITY COUNCIL. Then, either full Council or a Public Safety Committee will address Stu’s fate. Next, the CITY ATTORNEY would advise City Council on its legal powers to save Stu and send him home. Wait, there’s even more red tape: The Board of Animal Services must also vote on a 60-day suspension of the order to kill Stu. 3. The MAYOR decides Stu’s fate, if City Council votes to make a Stu recommendation to the mayor. Though I’ve started linking to Kinship Circle’s alerts (as opposed to re-formatting and crossposting) whenever possible, I decided to publish this alert in in entirety anyhow (and even though I did indeed link to it in last week’s weekend link roundup). It’s just one of those stories that boggles the mind; even more so since it’s been dragging on for nearly four years now. If you’ve been reading easyVegan for any length of time, you’ve probably already seen at least one alert dealing with the plight of Stu and Jeff de la Rosa. In August of 2005, Stu and another of Jeff de la Rosa’s furkids got into a scuffle, in which Stu was hurt. The “pet” sitter/assistant attempted to slip a harness over Stu’s head so that she could take him to the vet. Injured and cornered, Stu bit the assistant. Initially, there wasn’t an issue, as the bite was superficial. A month later, however, the sitter decided to sue, and Stu was confiscated without his father’s knowledge. Stu has been languishing in the “care” of LAAS (L.A. Animal Services) ever since. While experts have determined that Stu is not a danger, on death row he sits. Thus far, Stu has spent four of his nine years imprisoned, the victim of injured pride, ego and bureaucracy (all of them human). Stu, now a senior, has not shown aggression towards any of his handlers since the August 2005 incident, and yet the city remains dead set on killing him. They continue to fight for his death, in fact. Four years of food, housing, medical care and legal bills – you’d think the city of Los Angeles could find a better use of its money, no? The whole sad, sorry affair seems even more egregious in light of the “small victories” we celebrate daily – victories such as Gramby’s adoption after 2 1/2 years spent in a kenneled rescue facility. Gramby’s story, while unfortunate and commonplace, is also somewhat understandable – after all, he had no home to return to. His prison sentence was one of both necessity and compassion. But Stu – Stu has a life and family waiting for him. Stu remains imprisoned not out of human kindness, but rather human ugliness. There are no excuses for the injustices committed against Stu. The electric chair for a misdemeanor, indeed. Please take a moment to read the Examiner article referenced below, and contact the LA City Attorney, the LA Public Safety Committee, LA City Officials and the LAAS. Kinship Circle has helpfully provided contact info and a sample letter (see below), but personalize the letter if possible. By all means, be indignant, stern and outraged – but also polite and respectful. And also, spread the word – feel free to crosspost the Kinship Circle alert as written! 09/17/07 – Kinship Circle: September Kinship Circle Digest (Parts 1 and 2) – #44. Unhappy Anniversary For Stu! Will He Ever Be Freed? 09/08/06 – Kinship Circle: UPDATE: Stu Is Safe! FROM KINSHIP CIRCLE: We’ve followed Stu’s case for the last year or so. We’ve sent appeals to save Stu — to both Kinship Circle Primary and Animal Disaster Relief lists. This may be poor Stu’s “zero hour.” Read below and write to contacts, asking them to spare Stu’s life. In August, 2006 concerned animal lovers like you flooded the Mayor of Los Angeles and the Los Angeles Animal Services offices with emails, calls and faxes to save Stu from a planned “euthanasia” for haphazardly being declared a “dangerous dog.” Please, I need your help again. Stu is still alive a year after he was supposed to be killed because LAAS and Ed Boks believe the experts report that Stu was not dangerous. But on June 18, 2007, Stu had his day in court again… I’m sorry to say the our petition for a Writ to overturn the City’s ruling was denied this morning by the most erratic, rude and belligerent judge my attorney has ever encountered. I am preparing an appeal to the California Supreme Court to overturn Judge Yaffe who has been overturned before for such reckless disposition of the law. Legally, they can kill Stu at any moment. I am writing an informal notice of appeal which I will deliver to L.A.A.S tomorrow asking them to keep him alive until a formal stay can be granted. I am not finished trying to save him. At this point any letters of support to the department and the Mayor of L.A. would be appreciated. Enter the case number BS104836 for up to date court info. 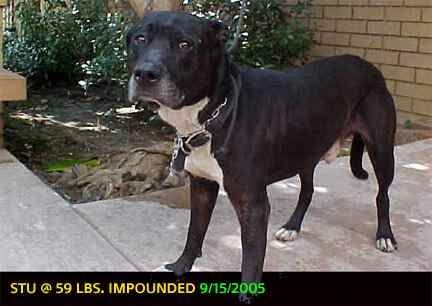 1/8/07: Stu, Los Angeles “Evidence Dog,” Pulled From Rescue And Back In Pound Stu is in grave danger. Again. 16 Months of confinement. From pound to sanctuary to pound again. Ed Boks’ heartless act of retaliation. Because I exposed Stu’s horrid, filthy, obese and tick-ridden condition while in the pound for over a year (see Stu’s website for photos and video), Stu was secretly moved by Animal Services to Villalobos Pit Bull Rescue in September, 2006. According to General Manager, Ed Boks that plan at the time was to have Stu’s behavior evaluated and he was to receive training “if necessary”. Mr. Boks stated that he would “re-open” Stu’s case so that Stu would receive fair treatment which was not the case in the initial hearing process. While at Villalobos, owner Tia Maria Torres proclaimed that no harm would ever come to Stu and that he would leave (except to come home) her sanctuary “over my dead body.” I was able to visit with Stu, exercise him and bathe him at the rescue. That evaluation took place and was done by Dr. Richard Polksy, PhD, a certified animal behaviorist. Dr. Polksy’s detailed and informed report found that Stu is not a “dangerous” dog. The doctor’s conclusion in that report is here. Because of the deplorable conditions at the Los Angeles pounds, and the chronic neglect of basic health care suffered by dogs held for long periods, I became active in rescue and have openly criticized Mr. Boks and his department for treating the animals inhumanely. This has sparked a personal vendetta against me by Ed Boks and he has now escalated his attacks on me, which included a December 8, 2006 nighttime raid on my home designed to thwart my rescue activity. See here. Why was Stu pulled from Sanctuary? What will his fate be now? Stu is now at North Central pound where he will most likely become sick and it’s possible they will find and excuse to “euthanize him.” Most dogs become sick at the pound and Stu has had upper respiratory infections, ticks and fungal infections on his paws while their previous. There are 2 veterinarians for six city shelters. Read the LA Times article here. Kinship Circle: UPDATE: Stu Is Safe! The following is a follow-up to an action alert sent out on 9/6/06. Congratulations Kinship Circle! Your flood of emails/calls regarding Stu, the dog in LAAS wrongfully slated to die, just may have saved his life. Never doubt the power of your words, the strength of your numbers. I am forever humbled by those who take action, whether it is a single life or many lives at stake… I will keep you posted on any change in events regarding Stu and LAAS. For now, Stu is safe. This alert is non-disaster related and was posted to Kinship Circle Primary. Since many on our Disaster Relief List work in hands-on rescue, we felt you might want to write/call on behalf of Stu. If not, simply delete this alert. Stu, a wounded dog who bit (minor) a babysitter who unwisely approached him last year, is set to be euthanized — possibly next week — even though a hearing ruled him non-dangerous. Please write on behalf of Stu and thousands of animals killed at L.A. Dept. of Animal Services shelters every week. Los Angeles urgently needs your help!